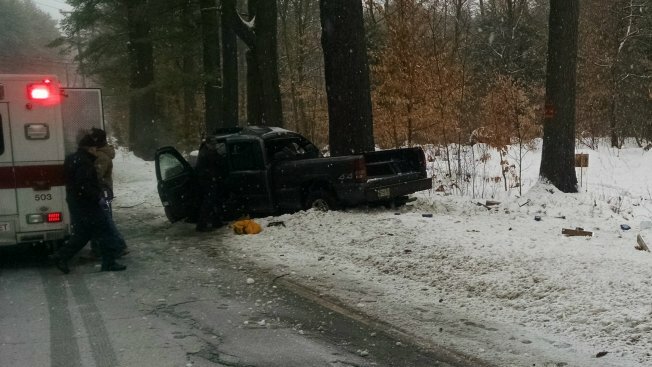 A photo of the fatal accident in Fryeburg, Maine, on Tuesday. A 47-year-old Maine woman was killed when a pickup truck she was riding in lost control on the icy road and struck a tree. At 11:13 a.m. Tuesday, a silver 2001 GMC Sierra pickup driven by Paul Cundiff, 61, of Porter, Maine, was headed south on Route 5 (Main Street) near Bog Pond Road in Fryeburg when Cundiff lost control of the vehicle and hit a tree. Rhonda Robblee, 47, of Brownfield, a passenger in the pickup, was pronounced dead at the scene. Cundiff was transported to Central Maine Medical Center and was in critical condition on Tuesday afternoon. Route 5 was closed for several hours while Fryeburg and state police investigated the details of the crash. Fryeburg Police Chief Joshua Potvin said it appears that the vehicle was moving too fast for the road conditions. A blood alcohol sample was collected from Cundiff, but police said they have no reason to believe the driver was impaired.